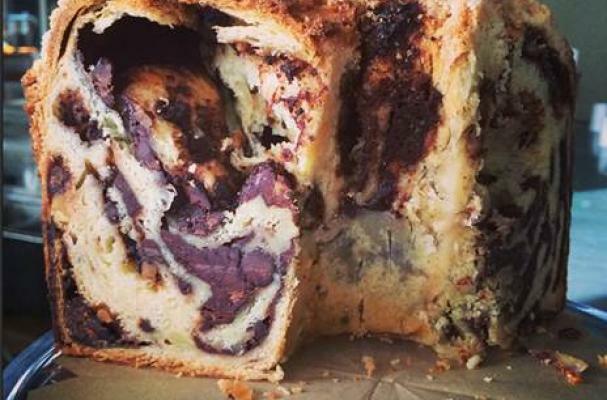 Chocolate babka is one of life's greatest pleasures. Buttery layers of bread woven with a ribbon of chocolate is heaven in each bite. This version comes from Stir Market, an artisan bakery and restaurant in Los Angeles. This recipe makes three chocolate babka loaves so if you are feeling generous, you can give the "extras" to your closest friends and family. I grew up in New York and have been on the hunt for the perfect Babka that I remember from the Jewish delis and bakeries that used to be all over the city. Now there are barely any great bakeries left so other than perfecting my golf game I enjoy retirement by experimenting in the kitchen. Babkas are a cake/bread with Eastern European roots and recently made famous by a Seinfeld episode at Zabar’s Market in NY. This babka is the one that consistently generates rave reviews for its irresistible combination of rich chocolate and other indulgent flavors. This recipe makes approx. 3 babkas in 9” loaf pans. Bake one or all three at once or store extra dough in the freezer, defrosted, and then baked off individually. This recipe has 3 components: the dough, the filling, and the topping. I recommend making the dough first and, while that rises, making the other components. I use a stand mixer, but you can also use a large bowl with a hand mixer plus some hand kneading. 1. Pour warm milk into a small bowl. Sprinkle yeast and pinch of sugar over milk, stir lightly; let stand until foamy, about 5 minutes. 2. In a bowl of electric mixer with paddle attachment, mix together 3/4 cup sugar, 2 eggs, vanilla, and egg yolks. Add yeast mixture and lightly mix to combine. 3. In a bowl combine flour and salt. Add to egg mixture, and beat on low speed until almost all the flour is incorporated, about 30 seconds. Change to the dough hook. Add 2 sticks butter, and beat until flour mixture and butter are completely incorporated, and a smooth, soft dough that’s slightly sticky when squeezed is formed, about 10 minutes. 4. Turn dough out onto a lightly floured surface, and knead a few turns until smooth. Butter a large bowl. Place dough in bowl, and turn to coat. Cover tightly with plastic wrap. Set aside in a warm place to rise until doubled in bulk, about 1 hour. 1. Place chocolate chips, 1/2 cup sugar. 1/2 cup raw sugar, walnuts and cinnamon in the bowl of a food processor, process into coarse crumbs. 2. Add the 1 1/2 sticks butter and process until well combined; set filling aside. 1. In a large bowl, combine sugar, flour, and butter. Using a fork, stir until fully combined with clumps ranging in size from crumbs to 1 inch. 2. Generously butter your 9-by-5-by-2 3/4-inch loaf pan. 4. Punch back the dough, and transfer to a clean surface. Let rest 5 minutes. Cut into 3 equal pieces. Keep 2 pieces covered with plastic wrap while working with the remaining piece. On a generously floured surface, roll dough out into a 16-inch square; it should be about 1/8 inch thick. 5. Brush edges with egg wash. Crumble 1/3 of the chocolate filling evenly over dough, leaving a 1/4-inch border. Roll dough up tightly like a jelly roll. Pinch ends together to seal. Now, twist 5 or 6 turns. 6. Fold long roll in ½ and brush top of roll with egg wash. Carefully crumble 2 tablespoons more filling over the roll and twist folded roll a few more times. 9. Bake Babkas, rotating halfway through, until golden, about 35 minutes test for doneness. Toothpick should come out clean of dough when done. Remove from oven and transfer to wire racks until cool. Remove from pans; serve. 10. Babkas freeze well for up to 1 month, just defrost for a few hours and bake.